I don’t spend a lot of time thinking about t-shirts. They are simply something comforting to throw on when I’m not interested in figuring out what to wear. Still, they have been carefully collected, each reflecting something . . . a place, an idea, a mood. Some are souvenirs. When they are souvenirs of my own travels, it means I’ve considered their design, their shape, their color, as I would anything I wear. If they are souvenirs of someone else’s trip, they make me think. Do I want to record where someone else has been? Is it somehow dishonest to wear a shirt from Tasmania if I haven’t been there? Or is it flattering to have been thought of in Tasmania? But that shirt won’t fit me the way a shirt I pick will. 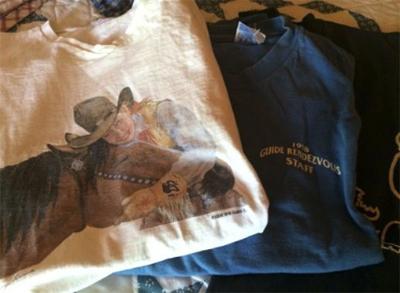 So, do I wear that shirt to honor the giver; to attract attention at the co-op; to fantasize that I’ve been there? My brother, who lectures on cruise ships, tells me that, when traveling, people always wear t-shirts from somewhere else to show this isn’t their first rodeo. In Uruguay, for instance, you wear a shirt from Punta Arenas. Or perhaps from Venice. I suppose I have some of that in me. I like wearing t-shirts that say Antarctica on them. Am I, perhaps, placing too much importance on all this? A t-shirt, after all, is a t-shirt. But I had a “Life is Good” shirt I loved that had a small picture of a typewriter on the front and, underneath, it said “writer.” I don’t feel a need to proclaim who I am to people who don’t know me, but the t-shirt – sky blue with long sleeves – fit marvelously and I always felt good in it. Sometimes I even wrote in it. And all during the time I was researching bison for A Chorus of Buffalo, I bought virtually every t-shirt Yellowstone sold with a buffalo on it. Yellowstone, not illogically, seems to be the foremost purveyor of t-shirts with buffalo on them. 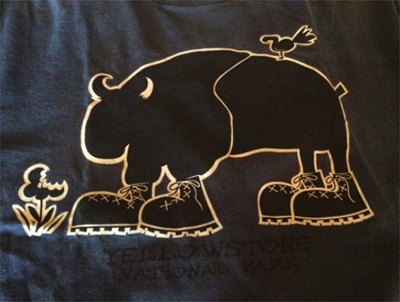 One of my shirts has a picture of a buffalo wearing hiking boots, which seems to sum up everything that matters. I would never have pursued t-shirts as the subject of an essay if a dear friend had not snapped a photo of me in what was (until the photo) my current favorite t-shirt. 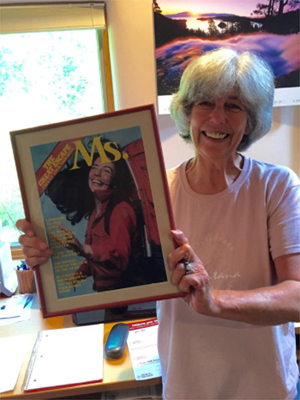 In the photo I am holding a picture of me on the cover of the July, 1975 issue of Ms. Magazine. I look different now. When that issue came out I was at the beginning of my first backpack in the West. I had gone to Olympic National Park to hike the cross-park trail from Whiskey Bend to Lake Quinault Lodge. The lodge was a little side trip after ending beyond the North Fork Ranger Station, a sort of luxurious payoff for 4 nights and 5 days on the trail. While I will always believe nothing is more luxurious than living in wilderness for days on end, an afterward of a lovely lodge, a hot shower and a good dinner someone else cooks is not something I’m apt to pass up. Arriving with time to idle before dinner, I just hung out on the lush green lawn sloping downhill from the lodge. Beds of blue hydrangeas surrounded the lodge and edged the lawn. Black bunnies, which I’d never seen before (or since), hopped everywhere. I had entered a magical world. Looking up the lawn toward the lodge, I noticed a woman sitting on the grass, totally engrossed in her copy of Ms. Magazine, with me right there on the cover. She had no idea she held me in her hands. How odd. I was there on the cover, and here on the lawn, and nobody else knew I was in two places at once.